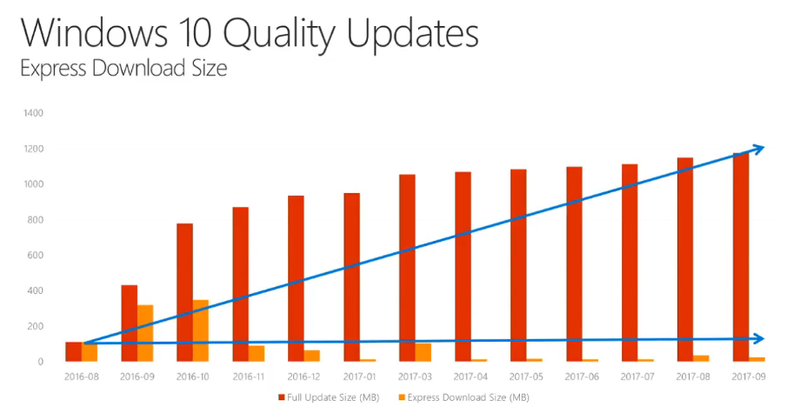 During Microsoft Ignite I got some great tips of how you can reduce the network impact of Windows 10 Feature and Quality Updates. I would like to share them with you in this blog post. Quality Updates – A single cumulative update each month with no features. Feature Updates – Twice per year with new capabilities. This means that we need to push out a larger amount of updates to each and every PC in our organization which will impact the network. On average the Quality Updates are 1GB per month which means 12GB traffic per PC per year. 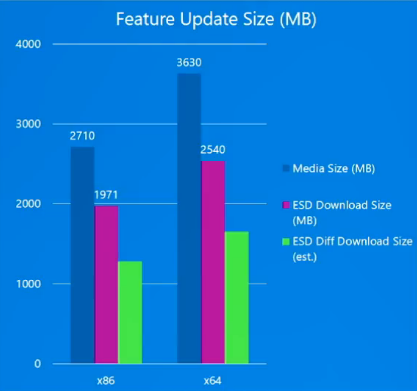 The Feature Updates are 3.5GB twice per year, which gives us 7GB traffic per PC per year. The total amount of traffic for these updates to each PC each year will be around 19GB multiplied with the number of PCs in your environment. So how to we reduce the network impact for these updates? This could be solved by a number of methods. Express packages are a way to significant reduce the amount of data that each Cumulative Quality Update. The way these Express Updates work is that when a new update comes out, only the CAB file “chunks” for components that need to be updated are downloaded to each client instead of the whole package, like a delta download. To is easiest to view in a graph. This can be enabled in WSUS and it’s now also supported by Configuration Manager 1702 and above. The one thing you must know when using Express Updates is that you need to ensure that you got sufficient disk space on your WSUS server. The recommended amount is five times the current space and that’s because the full updates are kept on the server for fallback scenarios and must be stored locally. The same idea with Express Feature Updates. Determine what files have changed since the last feature update and will only download those. This could potentially save about 35% over current ESD sizes. Note that this is only available with Windows Update and Windows Update for Business with Windows 10 1709, but it’s coming for WSUS, ConfigMgr and third-party tools next year. The end user experience will be unchanged where the update is deployed and Windows performs an in-place upgrade which normally takes around 30-90 minutes depending on hardware. It’s also important to know that this will not work if you skip versions. Microsoft said that they are working on reducing the amount of time it takes to deploy Feature Updates with each release, as the updates continuously getting better and smarter. 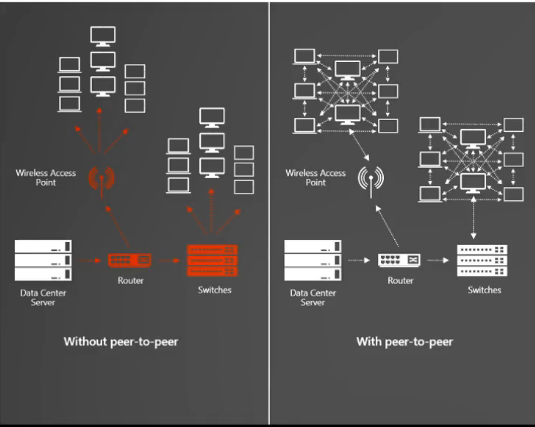 Peer-to-Peer distribution is something that Microsoft recommends using when dealing with Quality and Feature Updates. Approximately 90% or more of the traffic can be shifted from servers to the edges of the networks using this technology. Multiple tools are available for implementing this in your environment. BranchCache, which is supported by WSUS and ConfigMgr makes the clients an available source for distributing the updates around the local network. ConfigMgr Peer Caching is another method and there are also third-party alternatives to choose from. BITS Throttling is another way to control the network impact of the updates. When activated you limit the amount of network bandwidth that each PC can consume. In this way you can distribute content to PCs over a period of time, like days or weeks. If you combine this with BranchCache you can determine that a client can throttle traffic from the servers but go full speed from the peers in the local network. Note that implementing BITS could be challenging if BITS is already being used for other purposes in your environment. Scheduled distribution is a way to control how content is distributed from server to server and server to client. Bandwidth usage can be limited/throttled and restrictions can be set up based on time of the day. Servers or PCs can often be used to hold content, like distribution points around the network. I want to summarize this post with a picture of the updating tools I’ve been talking about and where they are supported or not. More information about the technologies described above can be found on technet.microsoft.com. You can also learn more about Windows as a service here.